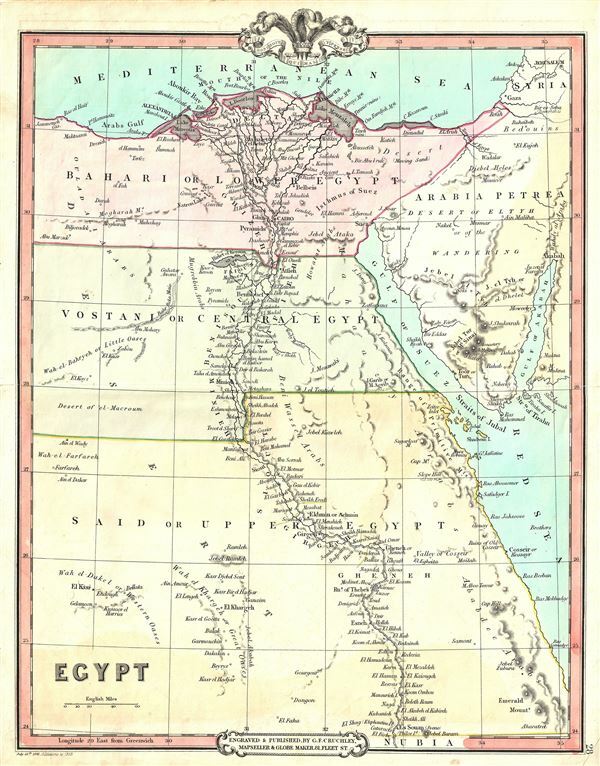 This is an attractive 1853 map of Egypt issued by George Frederick Cruchley. Centered on the Nile Valley, Cruchley's map covers Egypt from the Mediterranean to Nubia. The map is color coded and divides Egypt into three sections, viz. Lower Egypt or Bahari, Upper Egypt or Said and Central Egypt or Vostani. Egypt, in ancient times was divided into the provinces of the Delta, the Heptanomis and the Thebaid. The Arabs, in modern times, renamed these provinces to the Bahari or the maritime district, the Vostani, and the Said or the high country respectively. The map notes several Arab tribes, rivers, towns, mountains and other topographical details. Elevation is rendered by hachures.